When it comes to the safe working of our whole organisation we are confident that our actions speak louder than words. Whilst it is easy to write about what we will do it is far more beneficial to every person involved that we actually deliver what we promise. We continually monitor and assess individual training needs for all employees at every level. All new members of staff are thoroughly inducted so that they understand procedures on how to work safely. Trainees both management and craft are all educated from day one in how to work safely and the importance of this. 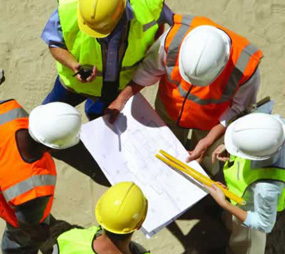 Ensure that all site staff and operatives are CSCS certificated. Our site operates are correctly supervised on every site with weekly toolbox talks to ensure that they are fully aware of all risks. Wide-ranging management and supervision by dedicated safety supervisors with the full backing and support of the entire company. Safe working practice applies to the entire company not just site locations. Mandatory PPE (gloves, glasses, high-vis vest, hard hat and safety footwear) on every site. Ensuring that our sub-contractors work as we do and not treated separately. Promotion of safe working with an award system. Lone worker system ensuring that no-one works alone and unsupervised. Directors and management ensure that our operatives are able to work safer on site. The key points are a basic list of our actions, a foundation to work from, making sure that safe working is not just a burden but a basic principle that runs through the whole company and becomes part of our culture at Weston Painting Contractors.